I tend to draw the same kinds of cars over and over again, and it’s really hard sometimes to break free of that and try new things. I’m so entrenched into a single style, as a matter of fact, that even my “new things” end up looking like the same kinds of cars I’ve been drawing for years! 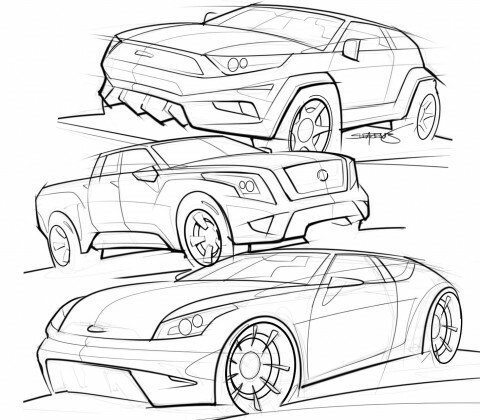 Right after I posted a summary of my recent car drawings last month, I took notice how similar they all looked. I’ve known for years that I tend to draw the same vehicles over and over again but seeing everything together in a single image was really eye opening! 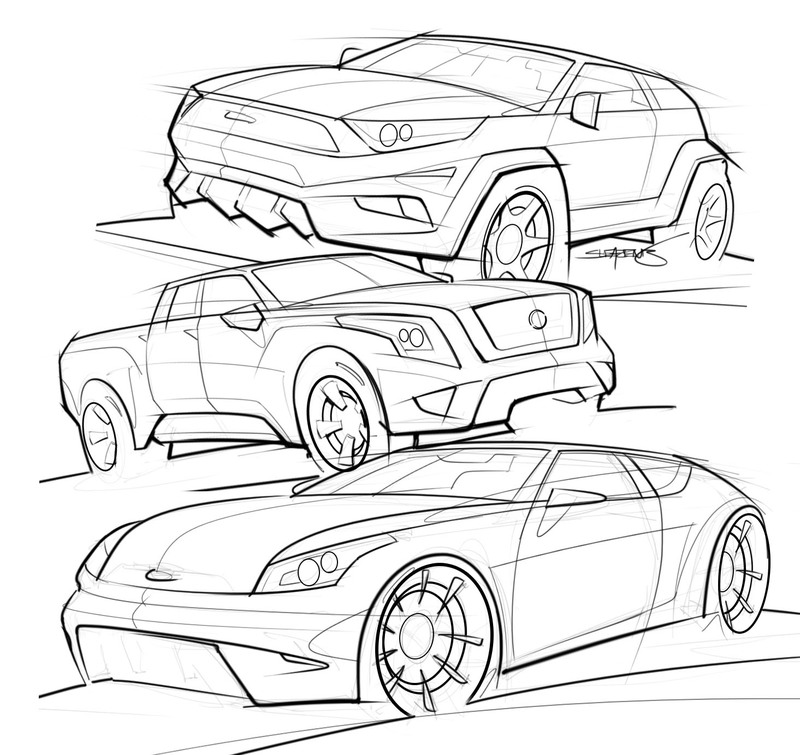 Therefore, I decided that I would focus on drawing and sketching sport utility and crossover type vehicles for the next few weeks – just for a change of pace. And you know what? Even my trucks still look like that two-door sport coupes that I typically draw! I think what I really need at this point is one of my transportation design professors from design school to make and appearance and ream me out for being too predictable and not pushing my design explorations far enough. I remember how crushing that felt to be ripped apart during open critiques in class, but you know what? I learned from that experience and I could definitely see myself growing as a designer while I was in school. But here I am, 20 years later (with very little practical industrial design experience under my belt) and I am finding myself wedged deeply into a safe and predictable style of design. One of these actually morphed into a station wagon of some sort, so I just ran with it. Perhaps I’m being too hard on myself. After all, I have absolutely no change careers and design cars for a living. That ship has sailed – at 41 years old, I’m not what the design studios are looking for. So what if I have a predictable style? More than anything I just want to refine my technique and be able to draw and illustrate cars in a way that makes people say “wow”. Do I need to be a cutting edge designer to do that? It would probably help I suppose, but I guess I’m not overly concerned about it.